Our e-commerce site routinely experiences a high-level of fraudulent credit card orders coming from just a few specific 'bad apple' countries. Is there any way to block traffic from specific countries to reduce fraud and improve our overall website security? Answer: Your problem is a common one, especially for e-commerce sites who operate internationally. According to merchant service provider Merchant Express, approximately 30% of all foreign orders are fraudulent. The majority of these fraudulent foreign orders tend to be from a handful of countries in the Middle East, Asia, and Africa. The result, just under $4 billion in total lost revenue by US businesses in 2008. One way to counter this insidious problem is to use a country IP block. 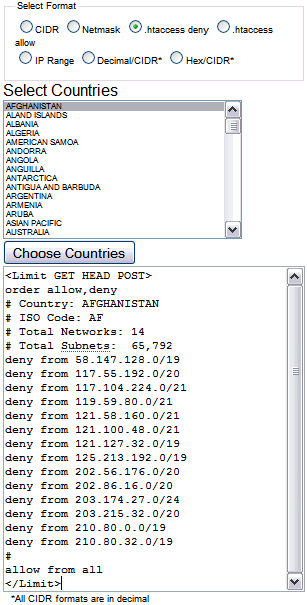 By adding a few simple lines of code to your existing .htaccess file, you can block a range of IPs within a specific country—or even an entire country. And, this is surprisingly easy to do. The screenshot on the right illustrates a great resource provided by Country IP Blocks. Select the desired format and your target country, click the Choose Countries button and, presto, the appropriate code is generated in the lower box ready to cut and paste into your .htaccess file. A word of caution: Remember that when you block a country to protect yourself from Internet fraud, you are also blocking EVERYONE within that country from accessing your site. That may include legitimate customers who have ordered from you in the past as well as honest prospects who may wish to order from you in the future.